Follows an existing septic tank to convert it to a full sewage treatment plant. FilterPod, the non-electric, sustainable sewage treatment solution for both domestic and commercial sites. Can be added to an existing 2 chamber septic tank. Crystal traditional two chamber Septic Tanks can be fitted with a septic tank filter to protect the soakaway. These septic tanks produce a much better effluent than 'Onion' shaped ones. Our laboratory tests have shown that Crystal septic tanks produce an effluent that is less polluting to the environment. They are very versatile and the inlet can be made to suit any drain depth. They also have a much shallower in-ground depth. 25 year tank warranty. Septic tank emptying arranged nationwide. Septic tanks can only discharge to a soakaway drainfield (with Environment Agency permission) and cannot discharge to a ditch. 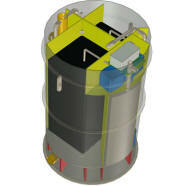 We specialise in low profile septic tank design and supply. Sustainable non-electric bio treatment plants produce almost pure water and can also be used to convert existing septic tank systems into a full wastewater treatment plant. They are installed after the septic tank and supply the missing biozone and final settlement tank present in a three stage sewage treatment plant. This is a much cheaper option than installing a new soakaway as the clean water can discharge directly into a ditch with Environment Agency Permission. Septic tank conversions, however, are now more expensive than full sewage treatment plants as the price of sewage plants has dropped dramatically over the last couple of years. Crystal supply both electric and non-electric sewage treatment plants throughout the UK. These plants replace the septic tank and soakaway and can discharge directly to a ditch or watercourse with Environment Agency permission. All our low cost sewage treatment plants have full EN 12566-3 2005 Certification and are accepted by the Environment Agency. Crystal sewage treatment plants are the modern bio answer to traditional septic tank systems without the smell, restriction on wastewater discharge options or bio-pollution - Just pure water. Our experts are here to help you with any sewage, septic tank or drainage issue you may have. We give honest, independent, impartial advice on all types of wastewater plant, septic tanks and septic tank Installation. We can organise a free septic tank survey of your site and free soakaway design to the current British Standard (BS 6297 2008) throughout the UK. Which Sewage Treatment Plants and Septic Tanks are legal in the UK? There are two categories of sewage treatment equipment - ones that claim to meet the standards required by the Authorities and those that have been tested for 38 weeks by the EN testing centres and proved to treat wastewater to a certain standard, giving a quality of effluent most suited to the site and customer requirements. Only sewage treatment plants with the EN 12566-3 Certificate and septic tanks with the EN12566-1 are accepted by the Environment Agency under the General Binding Rules. The EN12566-3 test costs around £40,000 per model. Many of the former tanks are simply sold on price, have insufficient volume to comply with the British Standard, blow insufficient air as small compressors are much cheaper, have never been independently tested by anyone and do not have the essential EN 12566 Certificate. The British Standards Institute has informed us that the EN 12566-3 2005 is the ONLY British Standard in place, although it could be a lot better than it is. See 'Why the EN 12566 is a bad test'. Many manufacturers, dealers and installers simply hope that the customer is either ignorant of the current EN 12566-3 British Standard, or they declare that the sewage treatment unit or septic tank conversion is 'designed' to or 'complies' with EN 12566-3 or the completely outdated BS6297 1983. On July 1st, 2013, the sale of sewage treatment plants and septic tank conversion units that do not have the EN12566-3 Certificate became illegal in the UK under the Construction Products Directive, so, hopefully, this will close the loophole. No 'In-Tank' septic tank conversion kits have it, so they are all now illegal for sale in the UK. Which Septic Tank Conversions are legal in the UK? No 'In-tank' septic tank conversions have the EN 12566 Certificate and we have have been told by Trading Standards that they are not to be sold. You can only convert a septic tank using an EN 12566-6 Certified add-on conversion unit. Which septic tanks are legal in the UK? Only septic tanks that have the EN 12566-1 Certificate are legal. A lot of septic tank 'advice' given by drainage companies is totally wrong and contravenes all the UK septic tank regulations. What design of wastewater soakaways are legal in the UK? Under the Environment Agency General Binding Rules, soakaway CRATES and TUNNELS cannot be used for sewage treatment plant and septic tank soakaways as they do not conform to the Building Regulations or the BS 6297 2007 for foul water soakaway construction.The E.A. have stated that only methods and materials described in these regulations can be used. Crates and tunnels can only be used for rainwater soakaways. Our specialist design work and advice is FREE, accurate, up to date and ALWAYS complies with British Standards, E.A. Pollution Prevention Guidelines and the current Building Regulations. We will always strive to find the most suitable product for your site. Please see our company profile. We pride ourselves on being experts in sewage treatment, not expert salesmen. If a septic tank is not the right solution for the job, you will have to buy it elsewhere, as we will only supply systems that are Legal and that will Work. Have a look around our site. If you can't find what you are looking for give us a call. We are only too pleased to help you with your sewage or septic tank problems. You may also find useful websites on our resources page.